A few weeks back a friend was having a party and looking for flowers to go on the cake that had a certain look. 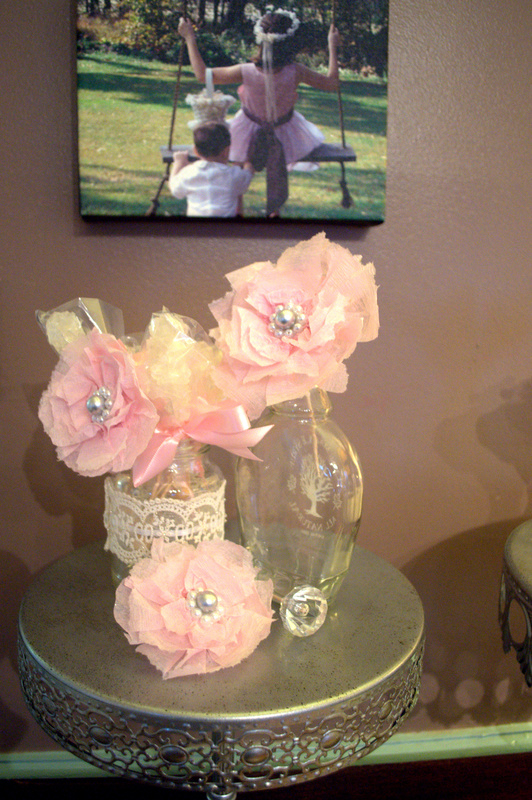 I saw them and thought they looked like Crepe Paper Flowers! Now, no one in this house had made them before, but really how hard could it be right? Knowing that we surely had enough craft junk here to be able to do them, we took a stab at it. 1. Tear the paper into small strips, about 1 to 2 inches. Flower petals don’t have a straight edge so these shouldn’t either. 2. 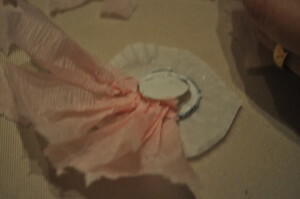 Have a cute little kid crinkle the petal paper pieces up a bit. Almost destroying something in the process of making things is, after all, fun. 3. Have another kiddo draw circles to use as a base on whatever paper you choose. We traced coins in two sizes onto card stock weight paper. 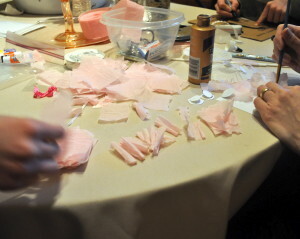 Then they can cut them out as neatly as they can. 4. 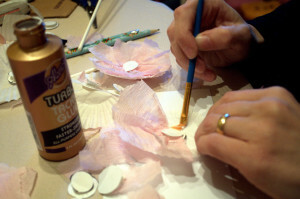 Keep another child busy with cutting tiny strips to make a little piece that will be glued between the two circles to add just a smidgen of space between the two circles that you then glue, large piece, bent strip then small piece to make center/base for your flower. 6. 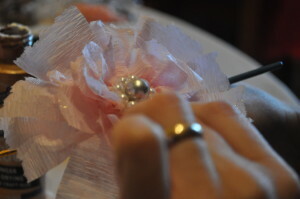 Find or make a sparkly center. We used a large bead surrounded by small beads glued to paper then glued it onto the center of the flower. We did have a great time looking through old buttons and beads and counting and sorting. 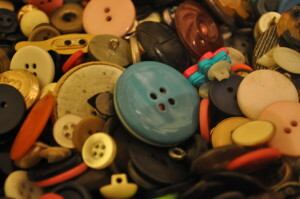 I don’t know why but kids love sorting buttons. 7. 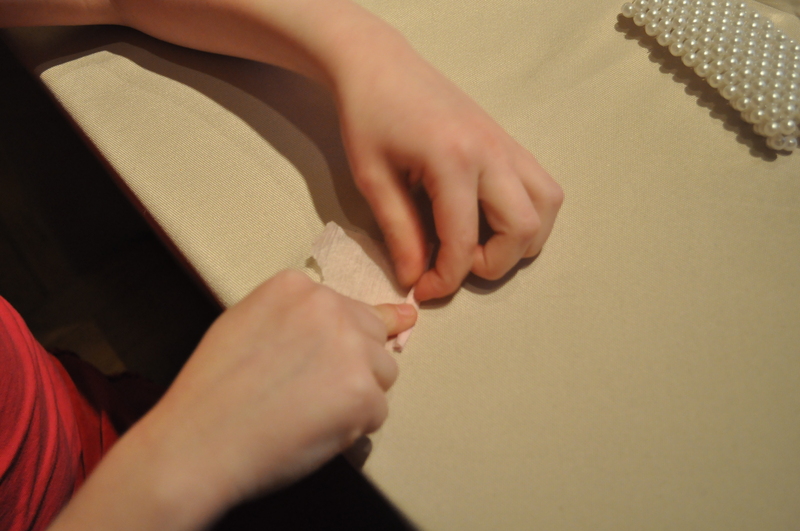 Glue and squish and mush the paper around till you like it. 8. 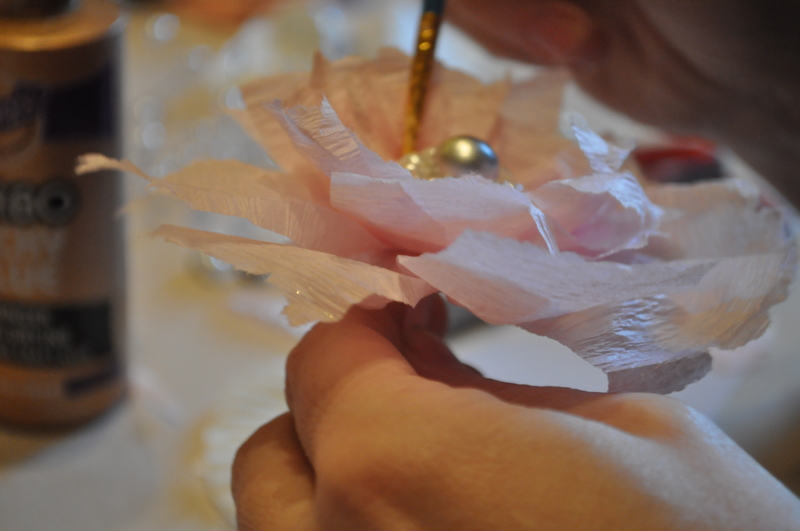 Then paint a little sparkle on the edges of the petals to make it a little more fancy if you want. 9. 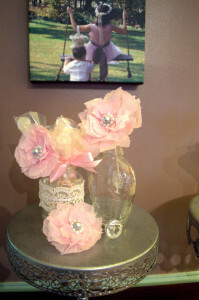 Finally attach a long tooth pick or straw to the back so you can place on a cake or in a vase, or wherever you’d like. Oh yeah, on the kid end of things I gave one the camera to take pictures of the whole project , just in case it worked. Photo Credit goes to Thomas Gaffney! It was a fun little project , kept them busy for two entire evenings and I hear made a great addition to the cake. That is so clever. They turned out lovely. Smart lady Becky.